Barrington Orthopedic Specialists Providers Mark A. Yaffe, M.D. 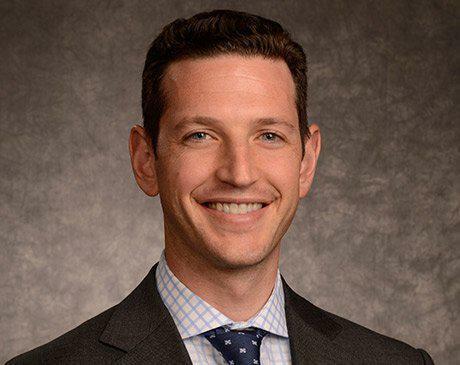 Dr. Mark A. Yaffe is a board-certified and fellowship-trained orthopedic surgeon with an additional subspecialty board-certification in hand surgery. He has a specialty focus in conditions of the hand, shoulder, and elbow. Dr. Yaffe serves at all four Barrington Orthopedic Specialists locations: Schaumburg, Elk Grove Village, Bartlett, and Buffalo Grove. Dr. Yaffe specializes in upper extremity trauma and complex fractures, work and sports-related injuries, degenerative and arthritic conditions, nerve and vascular conditions, and biologic injection therapy. He has published on topics including minimally invasive thumb joint arthroplasty, complex hand trauma, biologic injection therapy, and computer-assisted surgery. When he’s not seeing patients, Dr. Yaffe enjoys spending time with his wife and two daughters, terrarium design, yoga, and being an eight-time Chicago marathon runner. Dr. Yaffe received his undergraduate degree from the University of Michigan, Ann Arbor. He completed his medical degree and orthopaedic surgery residency from Northwestern University’s Feinberg School of Medicine in Chicago. He also completed advanced fellowship training in hand, upper extremity, and microvascular surgery at the Indiana Hand to Shoulder Center in Indianapolis. 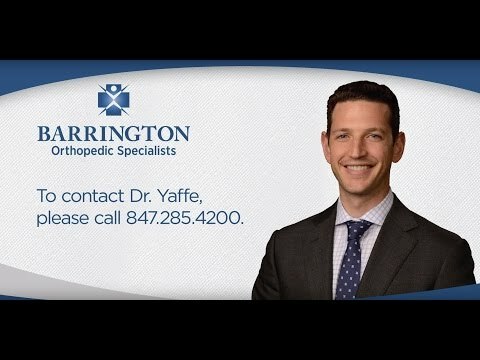 Call Barrington Orthopedic Specialists today or book an appointment online to schedule a consultation with Dr. Yaffe. Dr. Yaffe is a board-certified orthopaedic surgeon with fellowship specialty training in hand, shoulder and elbow surgery. He has received an additional subspecialty board certification in hand surgery. He specializes in upper extremity traumatic fractures and sports-related injuries, degenerative and arthritic conditions, and nerve and vascular conditions affecting the upper extremity. Dr. Yaffe joined Barrington Orthopedic Specialists in September 2014. Read More About Dr. Yaffe in the News! "I would like to thank all the great people that helped me at Barrington Orthopedic Specialists. My doctor was very nice and so was his assistant. Thank you Jesse for the perfect cast. Thank you to all of you." "Thank you Dr. Yaffe & Barrington Orthopedics Staff!! I'm so glad to be back playing baseball!! "Broken wrist needing surgery for plate and 8 screws. Dr. Yaffe was an excellent surgeon. Wrist has healed very well, thanks to Dr. Yaffe!" "Dr. Nourbash replaced my hip in July 2015 and it is perfect. I couldn't have had a better doctor and recovery. Dr. Yaffee did carpal tunnel on my right hand last December and it's doing better every day. Both doctors are the best and I highly recommend them and already have to those I see with similar issues." "I felt taken care of by Dr. Yaffe and your nurses. Everything was explained to me so I understood everything and all my questions were answered. Thank you." "I had been suffering from wrist pain for months. I had seen other doctors who told me that the only solution was surgery, this was unacceptable to me so I decided to get another opinion. After seeing Dr. Yaffe I was diagnosed correctly, and a small in office procedure was done. My wrist feels great, and I haven't had any problems since!" "14 months post shoulder surgery. Dr. Yaffe is very professional and provides a comfortable experience for his patients. My recovery was extensive because of my injuries, but at 14 months post surgery, I am pain-free and have normal shoulder and arm motion. 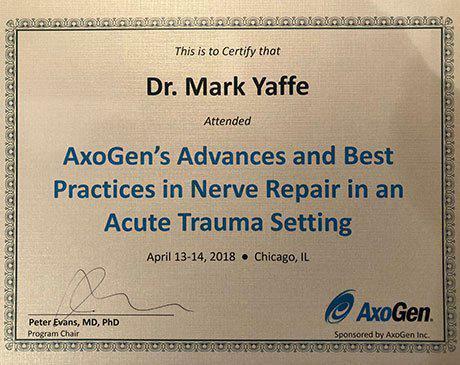 I would recommend Dr. Yaffe 100% of the time. Thank you!" "Dr. Yaffe has been a pleasure to work with for my orthopedic care. He takes the time to listen and answer all your questions and concerns. In short, he works with you as part of a team. I would and will recommend him to all of my family and friends." "Excellent!! Office staff was courteous and professional. PA was very courteous and well mannered. Doctor very very knowledgeable and stayed to answer all questions and went out of his way to provide recommendations of other doctors to help with my particular needs. Very very professional all the way from entering to exiting!! Thank you very much!!" "Dr. Yaffe and his nurse are both very nice. Dr. Yaffe has great bedside manner and takes the time to explain what exactly is going on and why and does not rush through your appointment. I am so grateful that I found him as a doctor. Thank you for the great care you have given me." "Dr. Yaffe explained the procedure to me in a way that a lay person understood. This is the first broken bone I experienced, so I was very concerned regarding the surgery that was to be done. The procedure went well. I am now in therapy. Dr. Yaffe has seen me twice since surgery and mentioned I've healed well. I would recommend your office to anyone that required orthopedic care. I am pleased with both the doctor and office staff. They were all extremely helpful and friendly."